« Parade? What African-American Day Parade? About two weeks ago, I got an e-mail from my cousin in Florida mentioning some retired Air Force colonel’s quest to rent out Radio City Music Hall’s auditorium to play the organ. I hadn’t heard a word about Colonel Jack Moelmann up until that point and the storyline probably wouldn’t have caught my attention without her pointing it out. I thought about it and thought about it; and finally decided to go. I must admit to not being too much of an organ fan. It’s a fine instrument and the one at Radio City has, with some qualifications, claim on being one of the biggest in the world. Hey, they call it “the mighty Wurlitzer pipe organ”. That’s a very cool name. I have to admit that I’ve never gone out of my way to listen to the organ, except in Iron Butterfly’s In-A-Godda-Da-Vida and Bach’s Tocatta and Fugue (the last link actually has a sound file). Neither was played last night, but I think the last one would have brought the house down. My best memory of an organ itself is meeting the uncle of a good friend and watching him build part of a world class organ for a large Virginia church. Amazing. So I got in and had a pretty good seat. There are actually two organ consols in the place. One to the audience’s left and one to the right. I made a guess that the one on the left would be the focus of the performance and before the show started I managed to catch a quick photo. This is the last of the “good” photos because they banned flash photography. I gotta bunch of lousy pictures. You’re going to see the best of the worst from here on out. 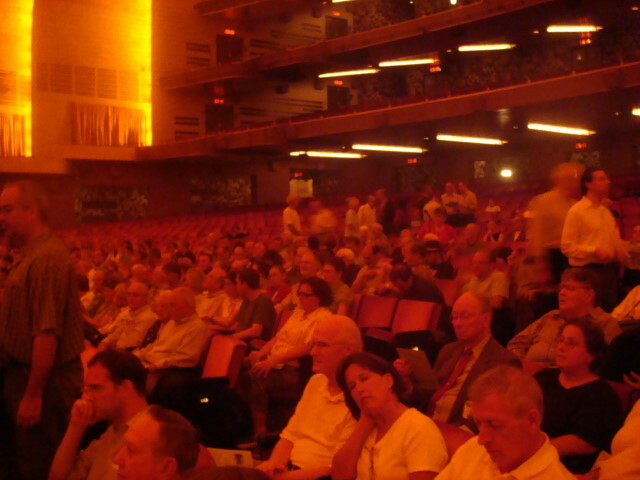 Radio City Music hall has about 6,000 seats from what I understand. The place did start to fill up, but I don’t think it hit the halfway point which is what I figure he would need to break even. The crowd was pretty eclectic, but certainly skewed toward retired types that appeared to be retired military. Well before the above picture took place, something very nice happened. I was sitting there and some guy in a white jacket appeared and talked to some people near the front. I really only noted him because of the white jacket and how out of place it was. He then went to a couple of other rows and I started to suspect it was the Colonel. I hadn’t seen any interview or any picture that I could recall. As he did a little bit of wandering, he came and started talking to some people two rows ahead of me and their words indicated it was Colonel Moelmann. He started talking and I recognized one of his phrases from an article I read; something about the Rockette’s wouldn’t come because they cost $90,000. I shoulda taken a picture, but I didn’t. Interestingly, nobody near me did either. I just couldn’t believe that the show’s star was coming out to greet his audience only about 15 minutes before the show. Anyway, the show started with an introduction by Fr. Gus Franklin and Nelson Page. They were front and center on the stage, but that area wasn’t used again until the very end of the show. After about a two-minute intro, Jack Moelmann came out and climbed onto the organ’s seating. For the period of his main playing time, he got on and off that thing about six times, each time we all wondered (and he wondered aloud) whether he was going to fall off the elevated perch. There didn’t seem to be much room between the back of his (movable) bench and the edge of the perch. How he didn’t fall at some point remains a mystery. Of course, the guy was probably walking on clouds anyway. Colonel Moelmann wasn’t alone in his playing. Early on, he was joined by Russell Holmes (the pianist for the Queen Mary 2 liner) playing on the organ consol to the right. I tried to get a photo of it, but no luck. The Colonel played for about twenty minutes or so. Most of his repetoire was pretty standard songs from the thirties and on. His first one: The Trolley Song from “Meet Me in St. Louis”. One of the most modern ones? Rubber Ducky. He did some Cole Porter, too. He was followed by a fellow organist, Walt Strony. The picture below is pretty much the sort of thing we saw all evening. 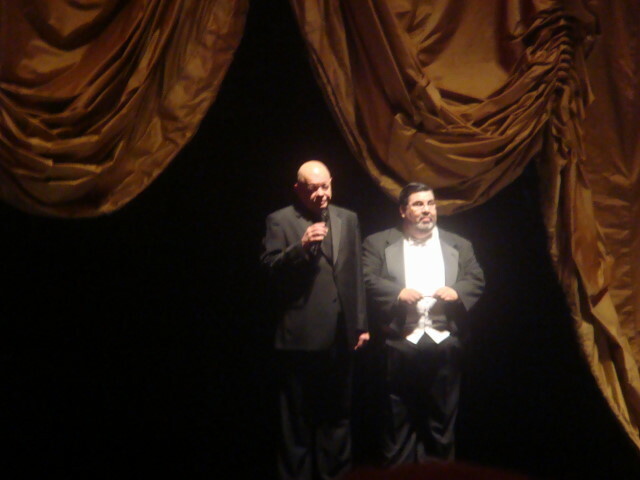 During his conversation with the audience, Colonel Moelmann stated that one of the “rules of show business” is not to turn your back on the audience. Well, with the Radio City setup, there was no way to not have your back to the audience. The next organist was Lew Williams. The next picture is such that both he and Walt Strony were hard to tell apart. At the very end, they went to the main stage and Col. Moelmann was presented with an award from the Theatre Organ Society International. The members of his Church sent flowers and the Colonel told us to get out. The program itself was pretty standard. 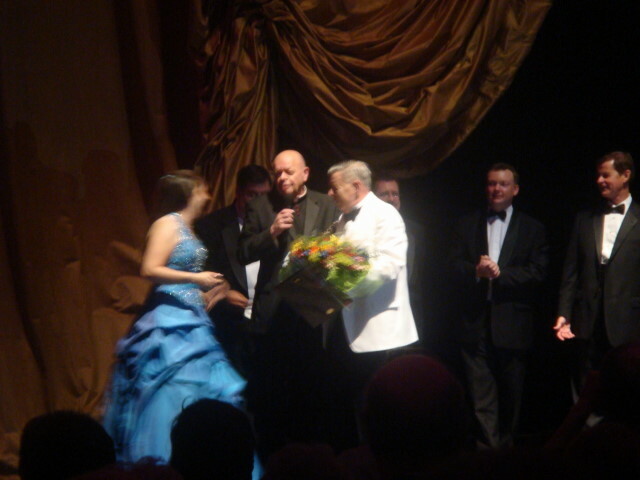 There was the first medley from Moelmann. He was joined by Russell Holmes for a few tunes. Walt Strony and Lew Williams did a few themselves, giving the Colonel a chance to take a breather. He came back to lead a sing-along. There was an intermission and then each of the four did some more playing. Plus, Fr. Franklin played some at the end with Moelmann. There was one classical piece performed, I believe by Williams. Lots of Broadway tunes. One or two items. His playing was fine, but his three main accompanists were much sharper. No problem. Second, there was so many other sounds coming along with the organ playing that it seemed that the organ was played almost as much as a synthesizer than just a regular organ. I don’t know these things, but some of the sounds were such that they may have been recorded to play at the touch of a button rather than the sound changing because of the flick of a switch. For example, some bell-type sounds were very fast and there didn’t seem to be any corresponding movement in the organists bodies to show that they were being created on the fly. But that’s of no consequence. It was good to see somebody’s dream come true. To his credit, the Colonel said that he his main dream was to entertain us, but however you cut it; seeing him do this accomplishment was one of the main entertainments of the evening. This entry was posted on August 10, 2008 at 10:51 am and is filed under Events, Manhattan, Mid-town. You can subscribe via RSS 2.0 feed to this post's comments. You can comment below, or link to this permanent URL from your own site. Thanks for this review. 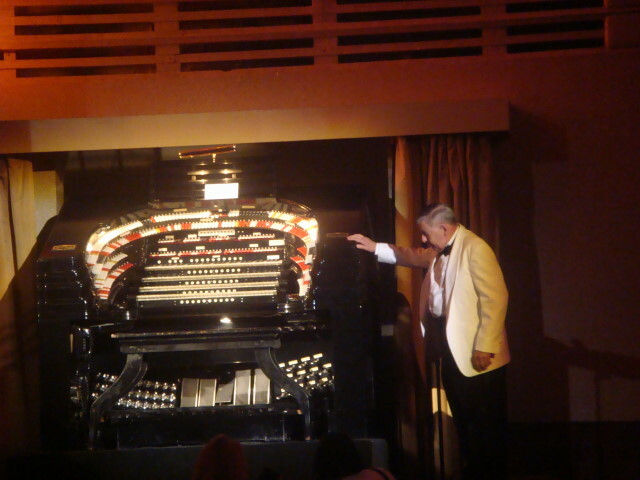 Many of us theatre organ aficianados could not be a the Hall last night to support our friends and artists, so it was grand to get almost instant feedback today–and from someone who is not a theatre organ enthusiast per se. By the way, I can assure you that all the sounds you heard last night came from the Wurliter! Remember that theatre organs were originally seen as orchestral cost-effective substitutes for silent films, so many symphonic effects were a part of their musical make-up: like, typani, xylophones, chimes, cymbals, sirens, “horse hoofs” etc. 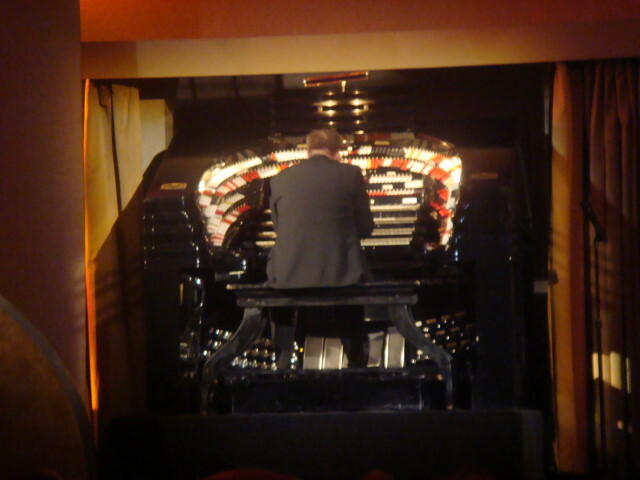 Although this is one of the last Wurlitzers built, and one that never saw silent film work until some revivals much later at the Hall, all those effects are there. They are NOT electronic recreations–they are the real things in the chambers! Thank you so much! I could not be there either, but would have loved to be. Part of the magic of theatre organ is all those extra sounds, and the secrets that allow the performer to make them happen without the audience seeing how he did it. Yes, they are real bells, a real siren, and so on, all designed to create the sound effects for a silent movie, but now also used to delight and entertain on their own. “I don’t know these things, but some of the sounds were such that they may have been recorded…” This is the problem with anyone being allowed to have a blog. You’re correct, though: you don’t know these things. 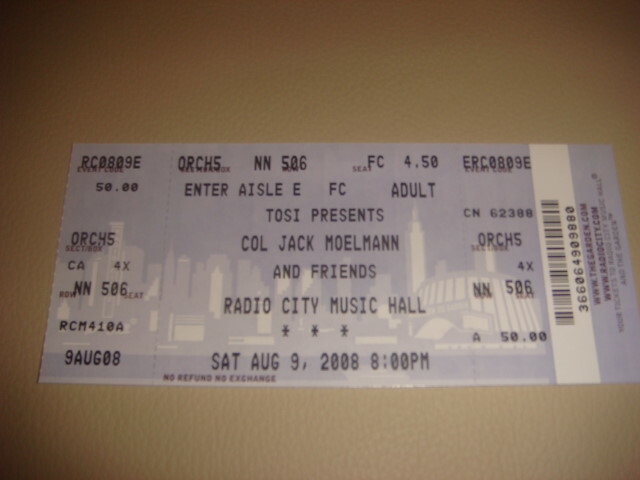 I haven’t heard Colonel Moelmann play in years but I knew this had to be good. i first heard Jack play when he played recordings for us while we were students at Bradley University. Later, he took me and another buddy over to a church he played at in Peoria, Illinois and let us listen to him practice. Jack was great at improvization. This had to be a great evening. I was there, but due to a delay in the trains from Newark to NYC I missed Jack’s traditional opening number of the “Trolley Song”. . The rest of the program was great as far as I was concerned — All the organists Walter Strony, Lew Williams, Russell Holmes and Fr. 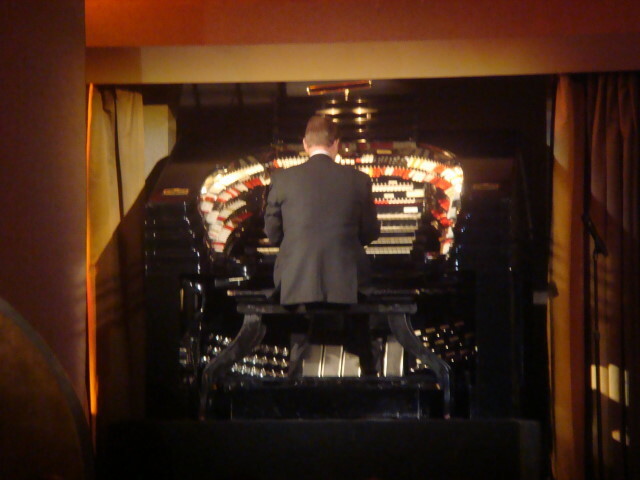 Gus Franklin did a tremendous job considering the amount of time allotted for practice and the layout of the Music Hall Wurlitzer being different than most other organs. It was a very enjoyable evening and I can’t wait for it to happen again, of course Jack will probably have to sell his house and car and dog to make it happen again. I wish i could have been there…….you have to do it again sometime…LOL! We came from California for the event and had a blast. Hearing Lew play the familiar Widor Toccata was a treat–I had never heard any form of classical music played on the RCMH instrument before. Jack (and TOSI) started a wonderful trend. Who will be the next person/organization to pick up the ball and present another program on this wonderful old Wurlitzer? You brought your dream to reality, and in doing so you truly made organ history. Bravo! 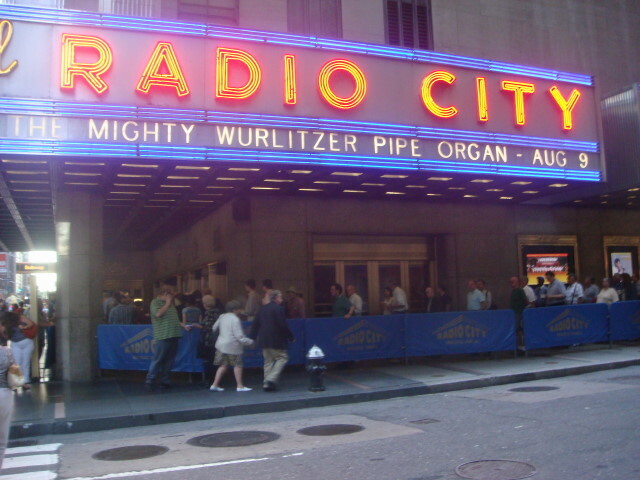 I have heard the Radio City WurliTzer in person once. 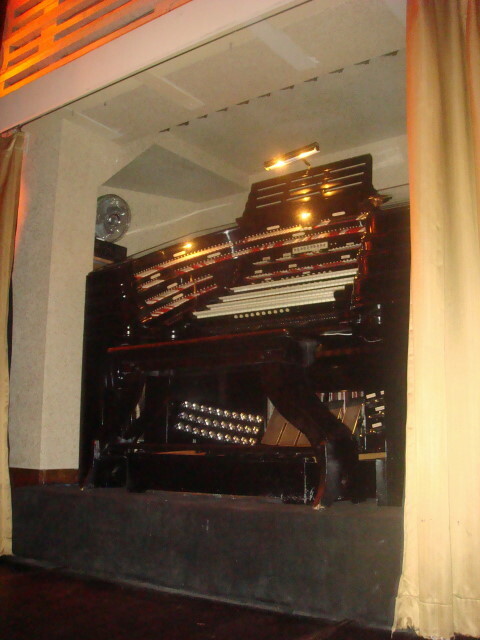 The first theatre organ recoding I ever bought was Ray Bohr at the Radio City City. What I discovered lated was that the organ heard on the recording was played at the RCMH sound studio which was about a 3/14. The intensity of the reeds and strings, gave my old pair of Radio Shack Realistic tweeter such a jolt—-they almost causht on fire. Im sure glad someone stole my AR 3as When im tired playing the organ I just plug in my Fender Bass guitar,and hook more tibias and drums to the organ and wire some more”Junchen” boards. Hope to hit NY in the future, and get some good bagels and pastrami I I have been trying to make good bagels for years, but the secret is in the NY water!. im better at making NY pizza with Italian sausage. Vaccum cleaners? my shop vac is fu;;. I’m still learning from you, as I’m trying to reach my goals. I absolutely enjoy reading everything that is written on your blog.Keep the information coming. I liked it! an advantage especially if you are creating an online talk radio station. is a lucrative deal for those who want their own stations. I have been in touch with many musicians, artists that I would have never heard before. you to talk with them. too. Some cameras are simple point and shoot while others have many different modes for taking pictures. until your tummy lets you know that you’re hungry again before opting for a healthy snack. Are you going on a lighthouse tour of the Oregon Coast. Most Coleman camping stoves powered with propane fuel even have electronic ignitions to save time and energy. The developers are saying that Defiance is a pixel perfect shooter, so if you aim at your target’s head it WILL be a headshot instead of the invisible dice rolling a 5 and telling you that you somehow missed. However, every character in the game (even supporting players) should be presented in this same detail. Harry Potter Hogwarts is one more entry into this new series of LEGO board games. on internet radio would give the business an international audience base. Listening to Internet radio is a breeze for anyone who’s familiar with the World Wide Web. Most radio stations on the Internet have offline counterparts. were futile, I was at the point of giving in when a friend of mine introduced me to this company. everything boils down to content. wing vents to twin exit exhausts along with the common M series recognized emblems. for revisiting. I wonder how much attempt you place to create the sort of excellent informative site. Testimonials and previous click here clients’ complaints. Aside from needing electricity to function. The object was a roundish amber colored orb of light. identical RSS issues? Anyone who knows the solution will you kindly respond? what in regards to the bottom line? Are you certain in regards to the source? Я читал эту часть письма полностью о в Сходство из новейший и предыдущие технологии, это удивительный Статья.